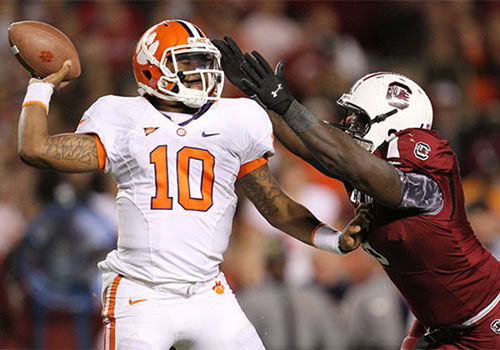 In recent years, college sports merchandising has become very big business indeed. College products now claim the top spot when it comes to branded apparel, beating out NFL merchandise with nearly 25 percent of overall sales. Major League Baseball finishes in third place with a nearly 23 percent share. A recent MarketWatch report claims that a quarter of goods sold through licensed sports apparel stores last year were college-branded, which is a significant nod to the increased interest in college sports promoted through wider coverage of events like March Madness and Bowl season games. That rise in popularity is an important development for colleges where sports teams merchandising can provide much needed help on two crucial fronts: As more institutions face rising costs and funding shortfalls, sports marketing can provide a significant revenue stream while also helping promote and establish the school brand in an increasingly competitive college market. Helping colleges and universities promote their college brand is something Barnes & Noble College has been identified with for a long time. Increasingly, school spirit lines have grown to become an essential part of the bookstore product offerings and branded apparel represents the top-selling items on store websites. 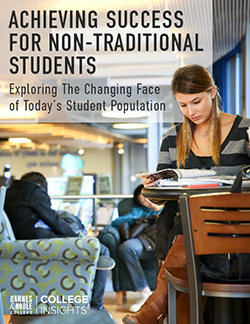 “We’re continually looking at ways to help our colleges channel more revenue to the campus and help promote school pride,” notes Barnes & Noble College Consumer & New Media Marketing Manager, Tamara Vostok. A case in point is one of the initiatives tested this past season, which represents a new concept in college sports merchandising. 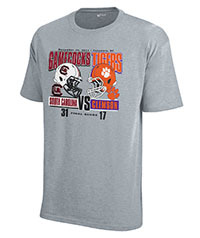 Working with their general merchandising teams, college bookstores offered Score T-shirts to be made exclusively available for the winning team in big rivalry college football games. “The program tracks a college team for a particular game and, if it wins, we immediately offer the t-shirt for sale on the website,” explains Barnes & Noble College Online Marketing Project Manager, Shannon Albers. How the program works is particularly impressive. “We’ll have the Score T-shirt image ready to go, along with the marketing, which includes a pre-designed banner image on the college store website, and an email blast ready when the team wins,” Albers explains. As soon as the winning result is known, the Score T-shirt is printed – complete with the score of the game – and launched on the site supported with promotional emails. College sports marketing has certainly emerged as a welcomed bright spot on the academic horizon. A study conducted by research company IBISWorld has projected that total sports revenue could grow to $4.1 billion by 2017, with college sports joining the massive NASCAR phenomenon in seeing the most growth. The Score T-shirt program is another way colleges can benefit and celebrate from their winning team’s victories – and the schools included in the program so far have seen fantastic results. Although the current program is offered in just a handful of schools, it ran through the crucial college Bowl season, and will extend to include the ever popular college basketball season during March Madness.